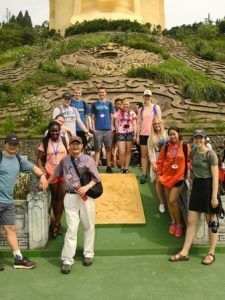 This past spring, for the first time in Hope’s history, not one but two May Term classes traveled to China. 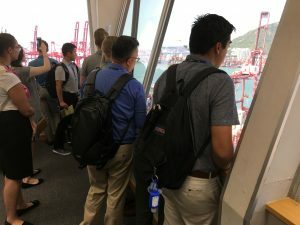 In “China’s Modern Growth,” students examined the nation’s economic policies and business development while touring four major cities as well as Hong Kong. In “China: Land, Wildlife and Culture,” students explored the ecosystems of China’s mountains, rivers and countryside. Both May Term classes visited Tiananmen Square. On the face of it, this could seem like a study-abroad city mouse and country mouse kind of story. In a way it is, but of course it would be. In Chinese cities like Beijing, Shanghai, Chengdu and Shenzhen — home to some of the world’s most famous businesses — Hope students saw firsthand what’s being done to affect the world’s second-largest economy. 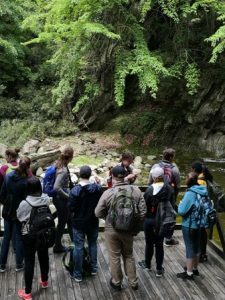 In the Chinese mountains of Tangjiahe Nature Preserve and lowlands of Minjiang River — home to some of the world’s most unique biodiversity — Hope students observed firsthand the likes of panda bears, takins, gingko tree forests and millennia-old irrigation systems unique to the world’s fourth-largest country. Yet, for as divergent as these two courses’ locations were, their lessons did share one commonality: Each exposed Hope students to historical, cultural and political aspects of a country that is often at the forefront of U.S. and international conversations. Now those exchanges have stuck with them well beyond China’s borders. That is the whole point of an international study experience: lessons learned make their way back home, get unpacked and then are used. 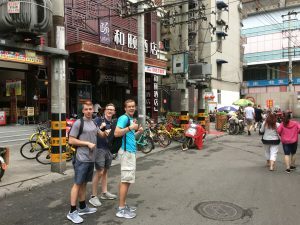 Andrew VandeBunte, right, and friends take on the city of Chengdu. 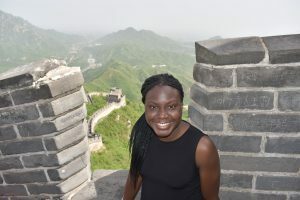 Clare Da Silva at The Great Wall of China. 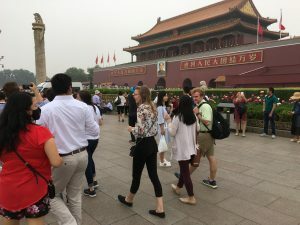 Senior Clare Da Silva, a biology major from Danville, California, concurs, as she took note of cultural comparatives while on the “China: Land, Wildlife and Culture” May Term. Travel abroad heightens one’s awareness of a home-country’s normative ways of life. Da Silva noted American social conventions in sharp contrast with Chinese ones. Such words of introspection are music to the ears of Hope educators. In hearing them, they know that some of their course goals and objectives have been met, no matter the subject matter. To be able to teach those lessons in China was both a necessity and a privilege. For Dr. Jianhua Li, associate professor of biology and co-leader with Bultman of “China: Land, Wildlife and Culture,” teaching in China was a brief homecoming — just as Hong Kong was for Smith. Li grew up in Henan in central China, and he wished to show Hope students not only his rural homeland but its cultural and urban features too. Biological outings stood side-by-side on the itinerary with trips to The Great Wall, The Forbidden City and the Summer Palace. The goal was to show as much of a spectrum of Chinese life as possible in a short period of time. The experience of studying in China positively changed VandeBunte’s outlook not just on China but on life. Before his May Term, he had never traveled outside of the United States. Now he has an affinity not just for international travel but for the lessons that can come of it.